U.S. Secretary of Defense James Mattis said on Wednesday that peace talks to terminate conflicts in Yemen were likely to take place in early December in Sweden. 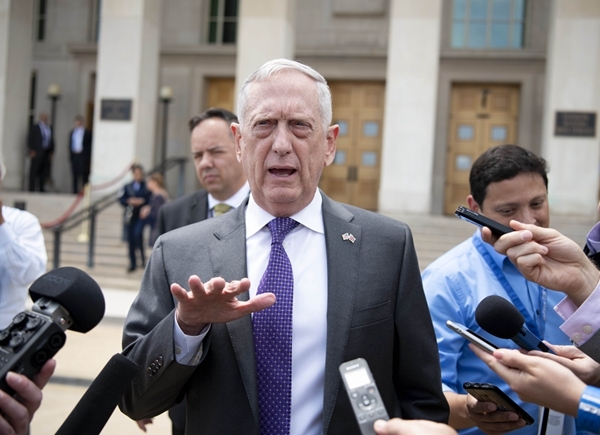 "It looks like very, very early in December up in Sweden we'll see both the Houthi rebel side and the UN-recognized-President Hadi's government will be up there," Mattis told reporters at the Pentagon. "The Saudis and the Emiratis are fully on board," the Pentagon chief added. Currently, the Saudi-backed Yemeni government and Iran-backed Shiite Houthi rebels both declared a temporary halt of fighting to pave the way for the peace talks, which will seek to end the Yemeni civil war that has killed thousands of people and brought the impoverished Arab country to its knees. UN Envoy for Yemen Martin Griffiths told the Security Council on Friday that he intends to convene the new round of peace talks between the warring factions "shortly" in Sweden in a bid to end the military conflict in Yemen. The fighting for the control of the Red Sea port city of Hodeidah erupted following the collapse of the peacemaking efforts by the UN in Geneva on Sept. 8, as the Houthi rebels refused to attend. The military conflict in Yemen began with the 2014 takeover of the capital of Sanaa by the Houthis, which forced Yemeni President Abd-Rabbu Mansour Hadi into exile. The Saudi-led coalition allied with the government has been fighting the Houthis since 2015.